Earlier this year Professor Ian Harper was appointed Dean of Melbourne Business School (MBS) and Co-Dean of the Faculty of Business and Economics (FBE). 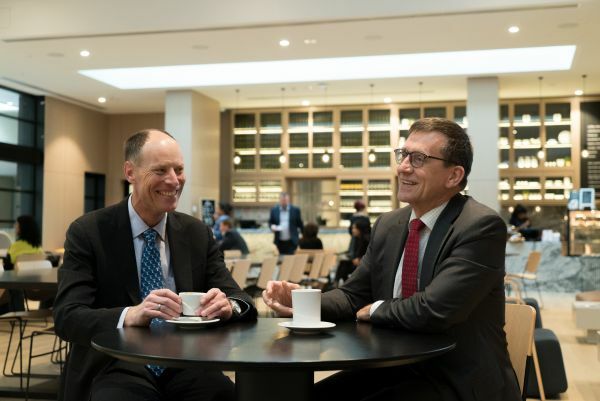 We caught up with Ian and Professor Paul Kofman, also Co-Dean of the Faculty, to discuss strategic planning, curriculum development, career outcomes, advances in industry and the leisure activities that help them unwind. Q. Professor Kofman, let's start on a high. What, for you, was the highlight of 2017? Paul: 2017 was a very busy year. A significant highlight was successfully implementing caps on our graduate intake which has had a very positive impact on the quality of the educational experience and the diversity of the students that enrol in our programs. And it was our first, I think, real attempt at controlling growth in graduate numbers to assure the highest quality learning experience. Q. Ian’s appointment comes at an exciting time of rapid change both in education and the business world. Paul: Certainly, if you go back in time 10, 20 years, then the University of Melbourne would have been ill-prepared for those changes. But in the last five years or so we've invested significantly in curriculum renewal and delivery, learning objectives and career outcomes. We see our education offerings in light of what the students expect to get out of it. I think it's undeniable that our students have very strong career expectations. They know the University of Melbourne has an outstanding reputation which sets the benchmark - not only do they go for a job; they go for a better job, so to speak. Ian is a highly-respected economist known for engaging with the public and corporate world. Those connections will prove incredibly valuable. But, importantly he also knows us very well. He held a professorship here for many years and was even Acting Director of the Melbourne Institute for a time. This facilitates the conversations we must have to continue to be relevant and agile in this changing environment. Q. And now you share the task of developing a five-year joint strategic plan to reinvigorate and strengthen the University’s offering and standing in business education. Ian: That’s one of the main things that drew me to the role when (Vice-Chancellor) Professor Glyn Davis first mentioned it to me. MBS and FBE are not the only parts of the University delivering business education. Training in medicine, engineering and veterinary science, for example, include aspects focused on engaging with the business community and commercialisation. This will all come under the strategic review. Paul: In the past, there has been too much focus on structure, employment contracts, supervisory relationships – it’s not helpful at this stage. Ian and I agree on many things – quality outcomes, strong connection with downtown, career outcomes for our students, and strong alumni relationships. We should set out the possibilities to advance those, then we can go back to structure and see which options work for us. Ian: It’s about taking the University’s traditional offerings and experimenting not just with repackaging, but with reorganising the material, infusing different material and allowing people to access the material in different ways. Coming from 10 years in the private sector, I’m aware of what the business community is looking for by way of engagement with universities in particular, and with education more broadly. And the University has already started on this journey by commissioning the Nash review. What we need now is a unique and unified strategy focused on market need. So what is ‘downtown’ looking for? Ian: First and foremost, much greater flexibility in delivery and modes of delivery. It is looking for the capacity to co-design and to some extent co-deliver the material. People want to spend less concentrated lumps of time in education and build up their qualifications using so-called stackable credentials. Paul: Yes, short bursts. It’s what employers want but it’s also what prospective students want. They don’t want to jeopardise their current contract by taking two years out, particularly in uncertain times where digital disruption does threaten some jobs. Ian: So, they can take subjects as smaller bites that add up, as well as skills-based credentials such as data-management skills. And of course, there’s critical-thinking, creativity, communication and collaboration skills – attributes that go beyond technical skills which employers are hungry for because these things drive the knowledge economy. Paul: We’ve come a long way since the start of the collaboration with MBS in 2013. We were awarded joint accreditation for excellence in business and economics education by EQUIS and joint re-accreditation by AACSB. And, for the first time we went to market under a single brand. These achievements address a significant issue – identifying as a single brand greatly alleviates downtown businesses’ bewilderment by the fact that there are two locations where we do business and economics. What is your vision for the future of business education here at the University? Paul: We started experimenting with online delivery, which is just one mode of flexible delivery, some five years ago with the first Massive Open Online Course (MOOC) at the University of Melbourne. Our faculty has been a frontrunner in that. Significant curriculum renewal is also underway. We’ve made a clear choice to focus on an education that is predominantly foundational, which allows our students to tackle an ever-changing future rather than pigeonholing them into very specific degree programs that are the flavour of the month. In doing so we’re very aware that we also need to provide the tools and skills for our students to hit the ground running. We’re focused on capstone subjects, work integrated learning and career outcomes. Ian: And even as we become more innovative and agile in modes of delivery, the central learning environment will remain the classroom. For MBS in particular, the classroom experience has been essential to the School’s success. We bring academic knowledge to the classroom but it is through students interacting with their peers in class that we create a more holistic experience, where students challenge one another and are driven to strive for better learning outcomes. Paul: Next, I think what we need to focus on much more keenly are our relationships with prospective employers and other stakeholders. We are making impact with our students, making impact with our research. We need to put the mechanisms in place to ensure this message filters through to employers. We've made small steps. 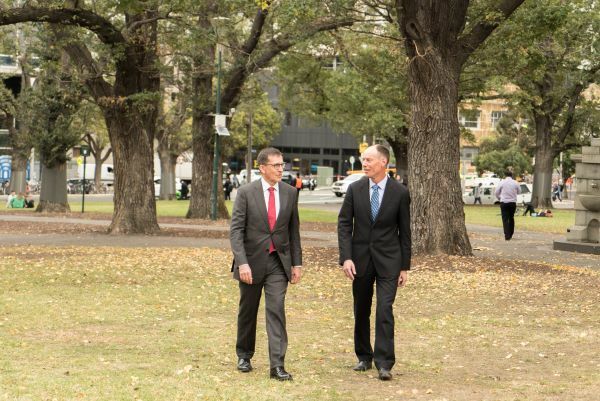 But, I think Ian coming on board, who has such strong connections with business, in Melbourne in particular, but more broadly in Australia, will open many doors for us. What would you say is the next big thing that will have a major impact in the business and economics world and how can we respond to remain a pre-eminent education provider? Paul: I think it's the digital disruption that is occurring. Rather than going down an alarmist route, I think it is timely to see the positives of that change in terms of making people's jobs easier, making interactions with clients in the finance industry for example, more transparent. Giving them more choice, more options. Those are the positives and let's start there before we focus on the negatives. Because certainly this new technology is going to be scrutinized as much as the face-to-face interaction currently is. The outcomes are still going to have moral implications that need to be considered. Ian: Yes, I think it’s artificial intelligence. I'm not saying that these machines are just going to do an H.G. Wells-like takeover. But, we need to learn as workers, or as operators of businesses, how to work with artificial intelligence in ways that build successful organisations to serve people. At the end of the day, our role in business is to serve customers. And the customers will want the usual things. They want their needs met, and they want them met at an acceptable or a reasonable price, and they will have views about how this is done. So that brings us right back to the agility required of employees and businesses. As the finance industry wades through some murky waters, it’s positive to hear such solid ethical values. Ian: Oh, well … look, without a bedrock of trust, there is no commerce. And ramping up regulatory interventions isn’t the answer. It will just result in those obeying the regulations getting swamped in costs, customers deciding not to do business with them and the cycle starts again. If there was a bedrock of trust, decency, honesty … it might sound like Nirvana, and maybe it is … but it’s something to strive for. Paul: Our students are opting for a career in finance – an industry where we know public perception isn’t all that great at present. So, we have an obligation to prepare them even more thoroughly for their employment experience. Ethics is an integrated component of our finance courses and we offer an online course in ethics in finance. Never has this kind of content and learning been more important. I don’t think anyone could argue that you have a challenging task ahead. How do you unwind after a stressful day? Paul: Everyone knows about my long-distance running but I'm currently experiencing a bit of a setback with an Achilles injury. Nonetheless I can still plod through. So that will continue and there's a 100k coming up. Going for a run after work is a nice way to unwind and to think through some of the decisions that you made through the day and reflect on them. Apart from that I love reading. I read a lot of Hemingway. Ian: I have my wooden boat, which gives me pleasure and is a source of distraction. I have a 30-foot classic wooden cruiser that I keep down at Williamstown. So, when I want to go down and just paint something or, you know, unscrew something and screw something else on, I can do that. There's always something that needs fixing on boats, especially wooden ones! Her name is Alchera - a word invented by a famous Australian anthropologist, Baldwin Spencer (who was foundation Professor of Biology at this University), and often translated as ‘dreaming’.